"In 2057, you take the role of a Terran astronaut who discovers a strange Black Cube floating in Space, and you are then teleported onto a mysterious Anterran spaceship called the ARK. You soon discover that you're not the first astronaut from planet Terra to arrive here: Philip Forte lived through the very same experience in 2011 and, fortunately, left a diary explaining his story. With this help, visit the ARK with one single goal in mind: getting back home!" 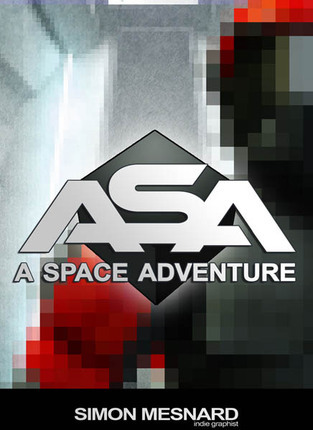 ASA: A Space Adventure was originally self-created with passion by Simon Mesnard, and now returns in a HD remake thanks to the help of indie developer Andrea Rinaldi. ASA is a first-person slideshow adventure game (point&click/FPA) reminiscent of famous works such as the Myst and Rhem series. You'll probably need a pen and a paper to write down your notes in order to solve the challenging puzzles that await you! ASA: Remastered Edition is exactly the same as the original ASA game, except that we've been working on several new features specifically for the Steam release. Despite many efforts in the past, the original version of January 2013 contained various issues that could not be satisfactorily resolved, so it was decided to restart from scratch with an all new engine. It has now become a new experience. A 2-in-1 playable demo (first version, 2013). Discover 2 different places of this scifi world. And if you like them, you will enjoy the remastered edition! #RemakeJam was a game jam where developers were invited to remake their very first game. I recreated the first room of ASA in full3d in 3 days! combined with an original soundtrack by Stélian Derenne (Karreo). The soundtrack of ASA was composed by Stélian Derenne. You can listen to it for free by streaming it, or you can further support him and purchase the whole OST from the KARREO library. Learn more about the creation process of ASA! Simon tells us how his first game was created, and about the challenges he had to deal with. Follow Simon Mesnard and The Icehouse collective on Facebook. Support the Black Cube series and Simon on Patreon!